How do You Feel to your Horse? An experience in Portugal last year permanently altered my concept of feel . Instead of always looking at feel from the direction of how the horse feels to me, it got me thinking instead about how I feel to the horse. It was the Fall of 2010, the event was the International Dressage Conference and I’m only now starting to put the pieces together as to what it really was that I was looking at. Maybe I’m not as quick as most folks, I tend to stew on these kinds of things for some time before the ‘ah ha’ begins to sink in. Watching a clinic from the sidelines can be more educational than being down in the arena. Riding in a clinic is often a rewarding experience but managing your horse and watching out for the other riders while simultaneously soaking up all the knowledge the trainer is attempting to impart inevitably leads to sensory overload. 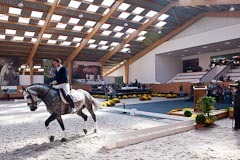 Perhaps it was all those fabulous Lusitano horses or the remarkably beautiful surroundings of the Daniel Pinto Academe. Either way there was something about the way these riders presented themselves in the arena that really caught my attention. For one thing they were mostly professionals, many having just returned from the World Equestrian Games in the U.S. These were elite riders on top level horses, it was like watching a symphony, the essence of pure horsemanship. They were also in a relaxed state- this is important. This was a clinic with a distinctly academic atmosphere. 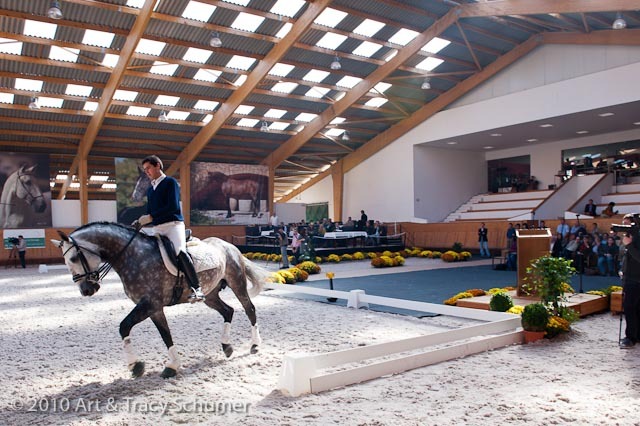 It was a platform where by many of the best dressage coaches from around the world could lecture in detail about specific movements, changes and mechanics; the horse/rider dynamic and how the most subtle of changes can alter the balance between the two. The riders were dressed in their everyday clothes and the horses seemed to know they were not riding at a top level show. This created a relaxed, low pressure environment. The participants rode silently, not just quietly but silent in the body. Years of highly disciplined riding had trained them to keep remarkably still in the saddle and yet they were affecting their horses in ways that the coaches saw as problems. Watching these horse and rider teams enter the arena one after the other, I thought they were all great but the experienced eye of the coaches saw other things. It took me half of the first day before I started to pick up on what they were seeing, the changes they were directing and how these often minuscule changes affected the horse’s performance. I’ve read about this kind of thing and frankly, I thought it was just a lot of snootiness coming from the dressage aficionados. All this ‘shifting of seat bones’ stuff, it just sounded to me like people being elitists about their discipline. How can a horse feel you shift your pelvis two centimeters through that thick dressage saddle anyway? Well, surprising as it may be he can! I was blown away too, but then I started thinking about what Ray Hunt used to say about the horse feeling a fly land on his back and after watching dozens of horses and riders going through these exact types of subtle changes, the pieces started coming together. One after the other, the horse/rider teams came and went, each looking wonderful but perhaps not as superb as they could be in the eyes of the coaches. A coach would direct a rider to change the angle of his wrists, another coach would direct a rider to lift his chin, another would see elbows too far from the ribcage or shoulders bunched, it went on and on all day. I always equated these kinds of corrections with making the rider look better, I never thought of it as a way to improve the horse, I simply missed the connection. What was remarkable was how these tiny changes affected the horse’s performance. The rider who rotated his wrists for example- wholly cow! The horse he was on changed. 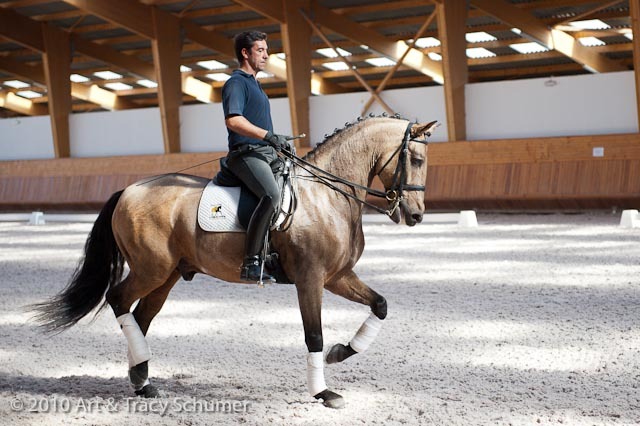 We could see this happening, the Lusitano stallion he was riding actually lengthened and softened, becoming more round; there was an audible response from the spectators as they could see the change and were equally amazed. As an isolated incident, there is no way anyone would have picked up on this but after seeing dozens of riders, one after the other and all of them making these little tweaks and watching all of the horses change, well it changed me as well. I started thinking about motorcycles, specifically how it feels when your riding a bike with a passenger on the back. I’ve spent some time on both street bikes and dirt bikes, taking a passenger really changes everything about how the bike moves and feels. It’s more difficult to steer for one thing and the slightest shift in weight from the passenger transfers right through the bike. This is the closest thing I’ve come across to feeling what our horses feel when we are on their backs. For folks who ride bikes, a passenger who won’t sit still is a danger and if you’ve ever been on a motorcycle, you know what I mean. Even the most subtle of movements will be detected by the driver of the bike, such as the passenger turning their head to look at something, raising their arm to wave at a friend, all of this is felt through the mass of metal your sitting on so why not a mass of living flesh? I’m just an observer here, I struggle to ride properly just like everyone else. If I can make an observation however, be able to translate that observation into words that can be understood, well that makes all the difference for me. If I’m lucky, it might help someone to get along better with their horse. Happy riding and have a great day from HMH!